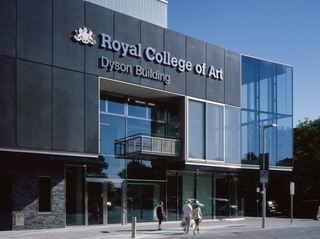 The College's new Dyson Building in Battersea was officially opened by the College Provost Sir James Dyson on 24 September 2012. The building is home to the Printmaking and Photography programmes, as well as InnovationRCA, the College's design incubator unit. The building includes a gallery space and lecture theatre which will be open to the public for a regular programme of exhibitions, talks and performances. This is the first time in the College's 175 year history that all four Fine Art programmes will be together at one location. The Royal College of Art has a lively programme of exhibitions featuring the work of its postgraduate students, lectures by leading figures from the worlds of art and design, fundraising sales along with many other events. The College also hosts a number of high-profile external exhibitions organised by selected partners. Most exhibitions are free and open to the public from 10am – 5.30pm daily (unless stated otherwise) but it is advisable to check by calling 020 7590 4444.